Q. What time does school start? A. School starts at 9:25 AM. Q. What time does school end? A. The school day ends at 3:25 PM. Kindergartners are picked up at the front of the school; all other children are picked up at the front gate of the upper yard. Q. Is there before or after school childcare? A. Yes – but you must sign up! Clarendon offers excellent, high-quality on-site childcare from 7:00am to 6:30pm. Childcare is run by a separate and private company, and therefore has its own admission process and maintains its own waiting list. There is a fee for childcare services. For more information, contact the director, Shelley Pope, at 415 759-1897. Admission to Clarendon Elementary School does not automatically trigger admission to childcare program! A. At regular drop off and pick up times, most parents park on either side of Clarendon Avenue (both uphill and downhill from the school on the school-side of the street, and directly across Clarendon as well). There is no parking directly in front of the school, as this area is reserved for school buses. Double parking is not allowed. If you park on neighboring streets, please be sure not to block neighbor driveways. 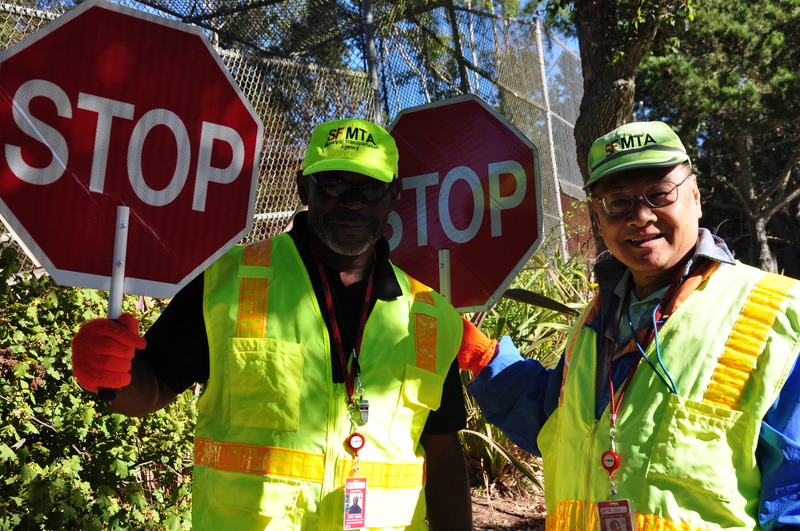 There is a pedestrian bridge just south of the school building, and there are crossing guards at the intersection of Clarendon Avenue and Panorama to help you cross the street safely. Please don’t jaywalk! Q. How do I know what classroom my child is assigned to? A. On the Friday before the first day of school in August, classroom assignments will be posted on the windows at the front of the school. The assignment lists will remain on the front windows through the first day of school. Q. What does my child need to bring on the first day of school? A. Please send your child to school with a backpack large enough to fit a 9″ x 12″ folder, a snack, and a lunch (or $2 for a school lunch, see below). Pencils, paper, and other school supplies are provided for your child in the classroom. Q. Is a school lunch provided? A. 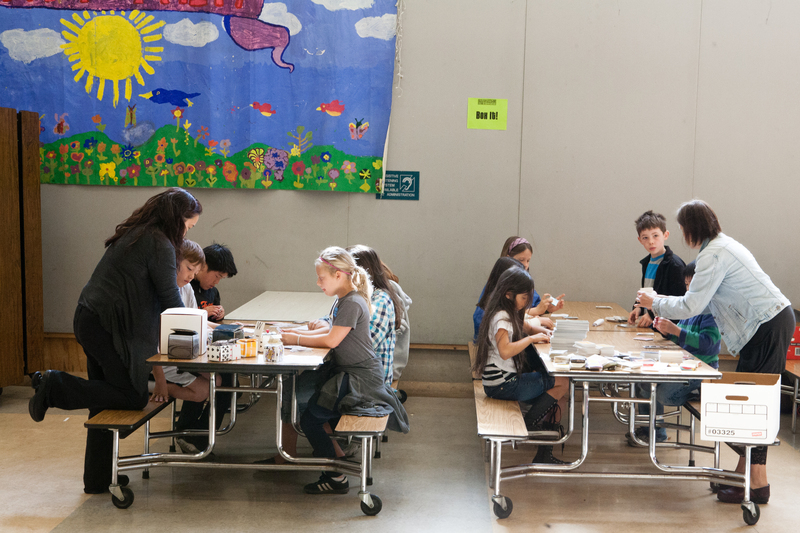 Students have the option of purchasing the standard SFUSD School Lunch. Click here to learn more about the SFUSD School Lunch Menus. Q. Is there any way for my child to meet other Clarendon students before school starts? A. Yes! There are two New Family Picnics held over the summer. When you come to the school to enroll your child, be sure to provide your email address so we can contact you about Kindergarten gatherings. Q. What is the school calendar for the upcoming academic year? Q. What is the Second Community Tax ID Number? A. The Second Community Parent Association Tax ID Number is 94-3205047. Q. What is the Second Community eSCRIP code? Q. Who do I write my check out to for GIVE, SCRIP, Walk-a-Thon donations, etc.? A. Make checks out to SCPA (Second Community Parents Association). Indicate what the payment is for in the Memo field. Q. How can my child attend Clarendon? A. Thank you for your interest in our school. Clarendon is a K-5 elementary school and part of the San Francisco Unified School District (SFUSD). The SFUSD is in charge of admissions to Clarendon. The Clarendon Second Community Program is an attendance area school, so some priority is given to students within the attendance area. Click here to learn more. Clarendon School is home to two distinct and highly regarded programs: The Second Community (SC) Program and the Japanese Bilingual-Bicultural Program (JBBP). Both programs share the same administrative staff and teach the same SFUSD core curriculum, in English. There is no immersion program at Clarendon although SC and JBBP both have second language components in their respective programs. Prospective students may apply to either or both programs and must indicate their preference on the SFUSD application. Students remain in the same program for their entire time at Clarendon. Parents wishing to switch programs must reapply at the EPC during the enrollment period. Students may enter in any grade in either program. Q. Can I tour Clarendon? A. Yes, we offer a limited number of tours from October through January. Information has been posted online with the tour schedule (see our homepage). In the meantime, please call the school for more information about signing up for a tour. Q. Is there school bus service to Clarendon? A. Yes. A school bus schedle is available from the school office or online at http://www.sfusd.edu. Click here to view SFUSD Bus Schedules. Q. Does Clarendon offer childcare before and/or after school? A. Yes. Clarendon offers excellent, high-quality on-site childcare from 7:00am to 6:30pm. Childcare is run by a separate and private company, and therefore has its own admission process and maintains its own waiting list. There is a fee for childcare services. For more information, contact the director, Shelley Pope, at 415 759-1897. Admission to Clarendon Elementary School does not automatically trigger admission to childcare program! Q. What are my child’s chances of getting into Clarendon School? A. The assignment process is handled entirely by the EPC (Educational Placement Center at SFUSD). The selection process and waiting pools are maintained by the EPC. The school site has no information on the selection criteria or the wait pools. The principal of the school CANNOT assist you in getting your child in. It is best to maintain contact with the EPC for the most accurate and up to date information. The notion that there is a waiting list maintained at the school site is COMPLETELY FALSE. If you have questions regarding the enrollment process or your status on the waiting list, or if you would like to lobby on your child’s behalf or explain special circumstances relating to your child, please contact the EPC directly. Q. Where do Clarendon students go to middle school? A. Clarendon students continue on to a wide variety of public and private middle schools after completion of 5th grade. Our current SFUSD assigned feeder middle school is Presidio. Q. Will my child’s younger sibling get a space at Clarendon? A. Younger siblings of children in grades K-4 receive “sibling priority” and are allowed to submit an application during the pre-assignment phase of the enrollment period. We have never had a sibling NOT be admitted when the parents were San Francisco residents and submitted all of the paperwork on time. Q. I cannot make it to a tour. May I visit the school on my own? A. Every year approximately 1000 people visit Clarendon on the school tours. It is at the request of the teachers that visitors are limited to these tours. It is for this reason that we offer so many tours over a two and one half month period. Although we certainly understand the desire for individual classroom visits, it is just not possible to accommodate the numerous requests that we receive. Our first commitment is to the students who attend Clarendon and we try to limit disruptions to their school day. You are, however, always welcome to come to the school office to have questions answered or pick up information.